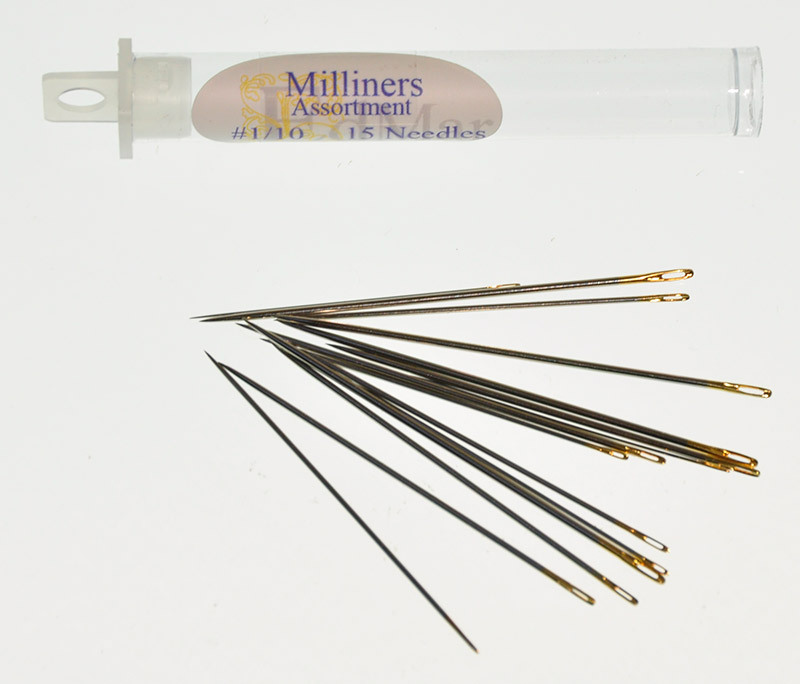 * Curved Beading Needle "Big Eye"
Ultra Thin double pointed "big eye" needles of spring steel, the entire length of which opens, for sewing and beading. Available in 2-1/4" (HL03) $1.00 and 4.5" (HL04) $1.00 . Sold Individually. 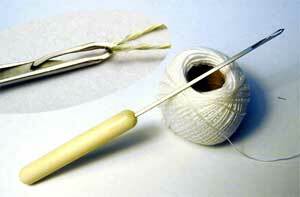 Suited for special doll projects, these sharp, fine, extra long needles can be used with the most delicate fabrics. 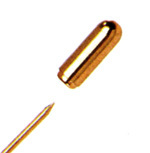 The finest (LB85) $6.00 is the diameter of a #10 (.0175") beading needle and will require a fine needle threader such as MO13. The fine (LB86) $4.50 will accept most threaders. 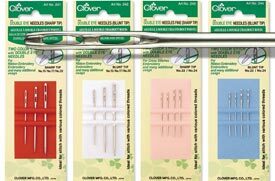 * Beading Needle/Threader, #16, 8"
* Curved Needle #141-12: 5/8"
A straight shaft, blunt point needle with an egg eye. 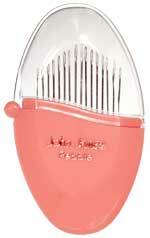 Ideal for hemstitching, working bullion stitches and sewing through pre punched holes in leather. Available in sizes #1 fineset (OS41) $5.00 , #7 (OS19) $8.00 , #0 (ET40) $15.00 , #2-0 (ET41) $17.00 & #3-0-heaviest (MY19) $21.00 10 needles per set. A flat steel bodkin, 3/16" x 2-7/8" for threading ribbon, Huck weaving on Monk's cloth. Available straight (LB81) $3.00 or with bent trip (LG02) $4.00 . 5 bodkins per pack. 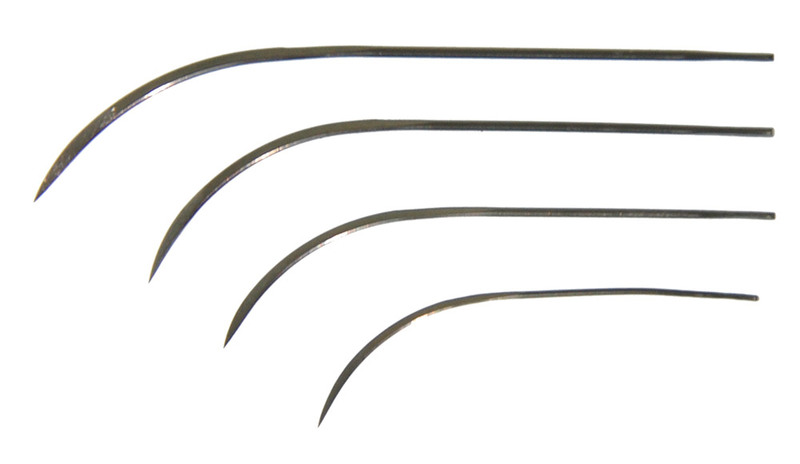 An extra long, small eye needle from #1 (MY06) $5.50 largest, #8 (MY07) $4.00 , #9 (MY28) $5.20 , #10 (MY08) $5.00 smallest. Also referred to as "Straw" needle. Needles are from John James in England and come 25 needles to a package. 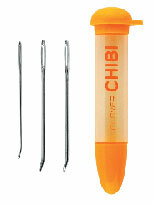 Set of 4 Bent Tip Chenille needles consisting of 1 ea -#14, -#16, -#18 and -#20. Ideal for embroidery when working from one side such as on padded boxes and stretched canvas. (ET20) $10.00 . A general purpose medium length sewing needle from size #6 largest (MY04) $4.50 , #10 (MY32) $6.00 , #12 (MY05) $10.00 . 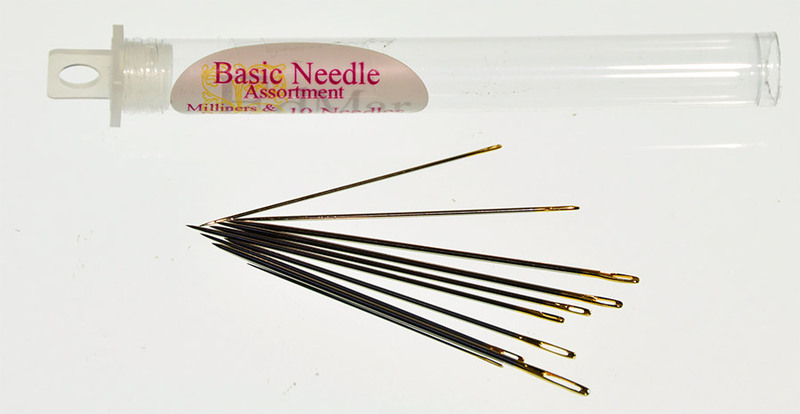 A blunt point, small eye lace weaving needle, the eye within the shaft diameter. 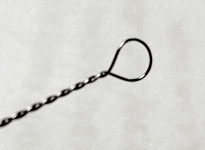 For heavier threads, a small loop of thread can be placed through the eye. 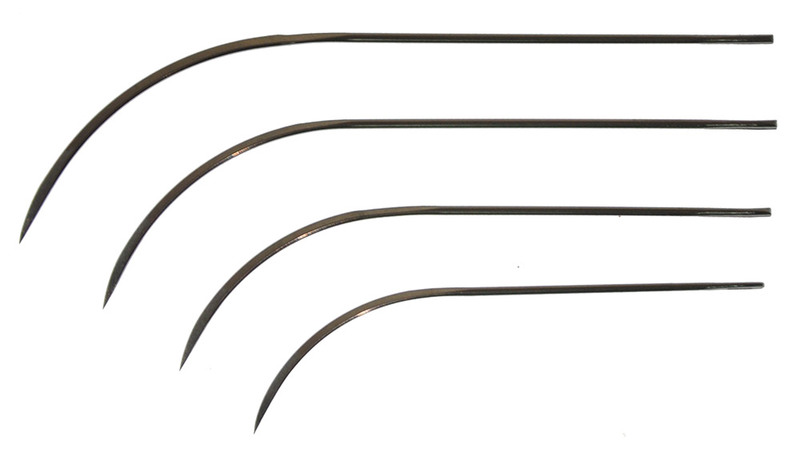 Available straight (ET43) $6.00 or with a bent tip (ET44) $3.00 . 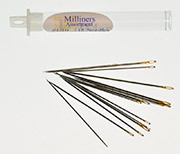 A friction cap for the pointed ends of stickpins or as an end cap for the fine knitting needles (4-0 to 6-0) . Available in gold or silver finish. (LC97) $1.50 .